With summer in full-swing, you’ve hopefully spent at least a little time sitting by the pool or sunbathing on the beach. Even if you haven’t, you can probably appreciate the need for a good old body exfoliation – especially if you’re about to go spend some time in a swimsuit! We’ve got some great recipes lined up to help you create your own DIY body scrub so your skin will be smooth in no time. And what makes it even better? You can use loose-leaf tea from Dollar Tea Club to create them! 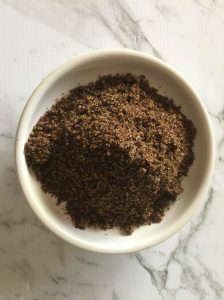 For this body scrub, we recommend using Gunpowder, a green loose-leaf tea blend from Dollar Tea Club. You can also use any loose-leaf green tea that you have lying around in your kitchen! Combine all your ingredients in no particular order – it’s as easy as that! Store it in an airtight container for future use and store it in your pantry or medicine cabinet. To use your DIY body scrub, take about a tablespoon or scoop some out of the container with your hands and massage into your skin for 30 seconds to a minute. You can use it on damp or dry skin, but make sure to rinse it off with water once you’re done. Make sure not to use it too often, especially if you have sensitive skin, since any exfoliator has an abrasive element and you don’t want to rub your skin every day. Green tea makes for a great ingredient in skincare, since it has a ton of antioxidants that will help replenish and reactivate your skin. Olive oil is very moisturizing and works with the sugar and other ingredients to soften the skin. All of these ingredients together make for a wonderful body scrub that you’ll want to use every week – and you can drink a cup of green tea while you’re making it! This next body scrub is more complicated than the green tea recipe, but believe us, it’s worth it! We recommend Masala Chai from Dollar Tea Club, a robust and full-bodied black tea that’s perfect for this recipe. In a large mixing bowl, combine all of your dry ingredients and the vanilla extract until they are thoroughly mixed. NOTE: Make sure that you’ve grounded all of your dry ingredients before you do this! You can use a mortar and pestle to do so or put your ingredients into a bag and go over them with a rolling pin. Heat up your coconut oil in the microwave for 15-30 seconds until it has gone from a solid to a liquid. Pour the coconut oil into your mixing bowl and combine all of your ingredients. Once everything is mixed together, you can pour your body scrub into an airtight container and you’re all done! Use right away or store for future use. There are so many great benefits that your skin receives from chai tea. Black tea has a ton of antioxidants that replenish your skin and ginger reduces inflammation on your body. Cloves have antibacterial properties and black pepper has antibacterial and antioxidant properties. Drink a cup of Masala Chai and you’ll receive even more benefits! You can read more about those here. This recipe is super easy, with only three ingredients! That being said, let’s hop right into the ingredients. Combine your white sugar and your ground loose-leaf black tea in a mixing bowl. Place your coconut oil in a microwave-safe container and microwave it for 15-30 seconds so that it turns from a solid to a liquid. If it’s hot inside your house, it might already be liquid! Pour the coconut oil into your mixing bowl and stir the sugar, ground loose-leaf black tea, and coconut oil until everything is coated in coconut oil. 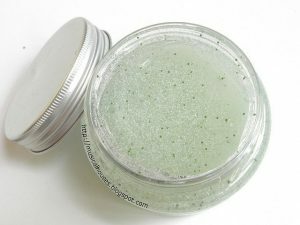 After mixing everything together, place your body scrub into an airtight container to use right away or in the future! You can use this body scrub on damp skin, rubbing it on the skin for 30 seconds to a minute and then rinsing it off with water. Black tea contains tons of antioxidants that are going to help rejuvenate your skin, making it a perfect addition to your skincare routine. It contains vitamins, minerals, and caffeine, and can help reduce puffiness of the skin if used when damp. If you drink a cup of black tea made from Assam Organic while you’re making your body scrub, you’ll ingest all of the health benefits, too! 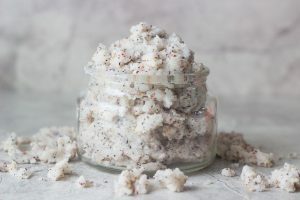 Next time your skin is feeling a little rough or you’re planning a trip to the beach, try using one of these recipes to create a DIY body scrub. The best part about it? It’s all-natural and can be made using ingredients from your kitchen, including Dollar Tea Club loose-leaf teas! Join our club for only $1 per month and receive three of our favorite loose-leaf teas every month. They taste delicious (and your skin will love them too!). This entry was posted in Did you know?, Health and tagged beauty, beauty tips, body scrub, dollar tea club, healthy, healthy skin, loose leaf tea, natural tea, organic tea, skin, skin treatment, skincare, tea.